If I use CPU Burner then with 2 cores, CPU load due to Furmark might drop to ~30%, and after quitting CPU Burner, it might or might not stay there (or go back to ~60%). If I use CPU Burner then with 4 cores, CPU load due to Furmark might drop to ~2.5%, and after quitting CPU Burner, it might or might not stay there (or go back to ~30%). Wadu heck? Initially I though "Shoot, my Zotac barebone with a GTX1060 GPU has issues with drivers downloaded directly from NVidia." Because I saw an increase of CPU load during running Furmark from 30 to 60% after I updated from the latest manufacturers drivers (376.33). During more extensive testing I found out that CPU load created by Furmark does not mean anything performance-wise. FPS do not go down more than 1-2 frames (from 55 to 54 fps) due to high concurrent CPU load. Furmark might or might not stutter for a moment, but it will recover quickly and continue running with nearly the same performance unless concurrent CPU load actually reaches 100%. Maybe you will find the solution to your CPU issue (the thread affinity mask). 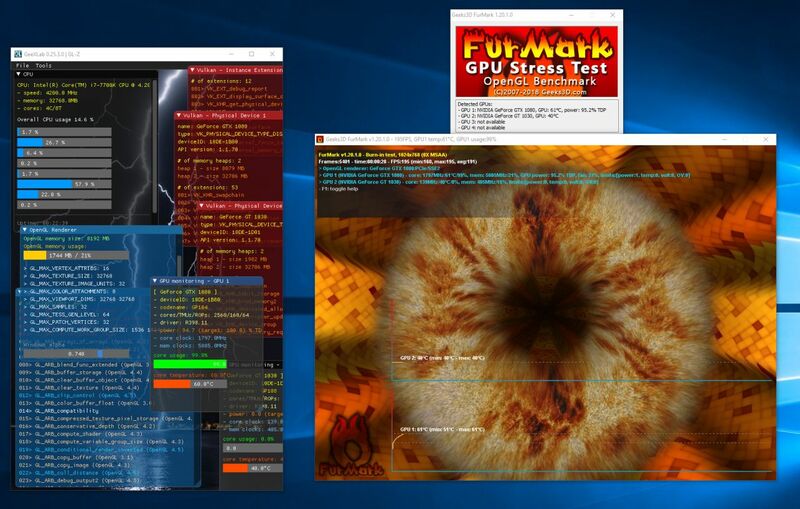 FurMark does nothing in the background, it's just a render thread that sends 3D instructions to the GPU to burn it! JeGX, thank you for the reply. I can now say that I observed this phenomenon on two quite different PCs with Furmark Versions 1.20 and 1.19. And yes, the download size is around 10 MB. One is a barebone mini PC with an i5 7500T quad-core (no HT) and a GTX1060 in MXM (?) format, and one is a regular desktop with a i5 4460 quad-core (no HT either) and a GTX980Ti. Both PCs have 4 threads and neither 60 nor 30% of CPU load do seam to correspond to a particular thread count (or 2.5% for that matter). What is the CPU load created by Furmark you get? And does it vary as much depending on concurrent load as on my PCs? I want to make sure that nothing is wrong with my VR setups, because I cannot monitor system performance as closely during their actual application. For your information, here is the CPU usage with FurMark running at 1024x768: around 15% on 8 logical cores. When the affinity mask is set to 0 (default value in FurMark 1.20.1), the CPU load is spread on all cores. So 15% with Hyperthreading would mean 30% without, if I understand the slightly misleading CPU load info under Windows correctly. That could mean that you see the same 30% load I often see. I assume this 15% load is constant right from the start? Yes the 15% load is constant and is equivalent to your 30%. Thanks for the info. I think now that everything is fine with my render PCs. Nevertheless, just out of curiosity, I would be interested in whether you can also 'force' Furmark to reduce its CPU load via concurrent load from CPU burner without any substantial FPS loss.